Welcome to Our Homestead! Where chickens are loved, children run free range and everything is yard to table. Believe it or not a couple years back when we first began our homesteading adventures, I would have never dreamt of raising pigs for meat. I was scared of their smell. I was scared of slaughtering them. 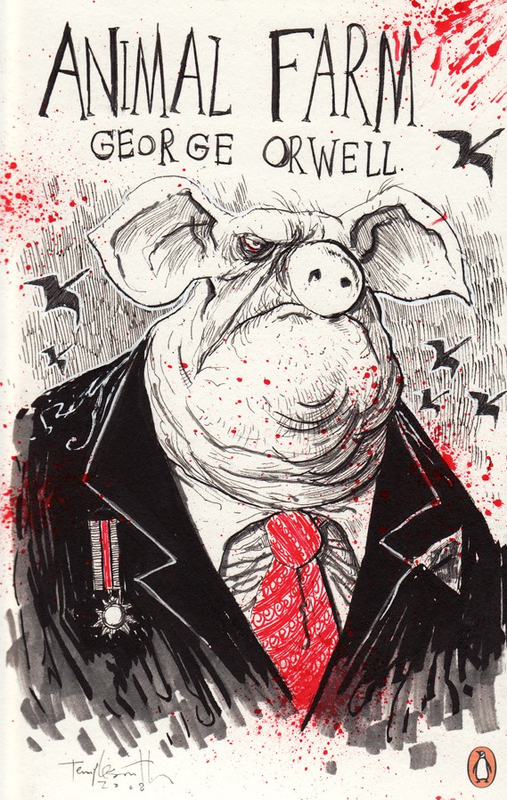 And for whatever reason that scene from Animal Farm always really stuck with me. As time went on I became pretty decent in the garden. I learned to can a large portion of our harvest and my hens were laying a couple dozen each week. I realized it was time to expand my horizons, and so the discussion began between James and I. What would be a realistic next step? Our dreams of raising a dairy cow or two just seemed too large of an undertaking at the time. James is a hunter and I admit, having a freezer full of venison for the winter, along with our fresh and canned vegetables made for a rewarding season. It seemed that raising our own meat would be the next step toward true homesteading and self sustainability. I read and read, and read some more… I mean, I really did my homework people! I had so many questions but when push came to shove we just lept in… Figured it out- and now I can’t imagine a spring that I won’t be raising pigs. I can honestly say that it was one the the most rewarding experiences of my life from start to finish. It was emotional at times, but I learned that it should be. Quality of life for any animal is what makes the difference. Whether they be a household pet, or livestock that you raise to feed your family- providing a happy and healthy life will produce a wonderful product, and give you peace of mind and heart. Saying goodbye in sacrifice or illness is inevitable on the homestead, and will always really hit you in the feels. But let’s get back to the rewarding part shall we?? I can remember writing down question after question about raising the pigs before we picked them up for the first time. I was a little embarrassed to even ask fellow farmers because I felt like I should already know the answers. WRONG! You never know everything there is know until you experience it first hand and even then, nature will probably throw a curve ball at you. It’s just natures way. 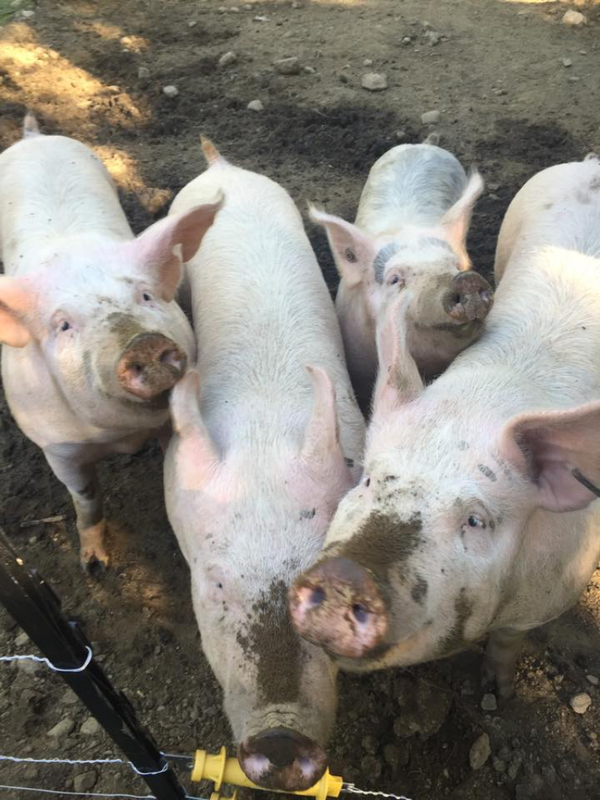 So if you’re considering raising pigs to feed your family or sell for profit on your small farm, I’ve compiled a list of commonly asked questions before you get started. 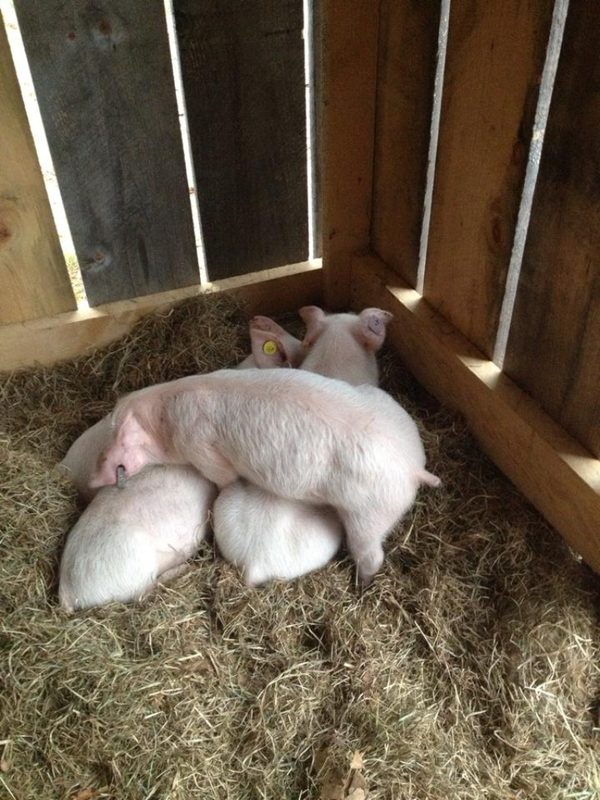 Q: how much space do you need to raise pigs? 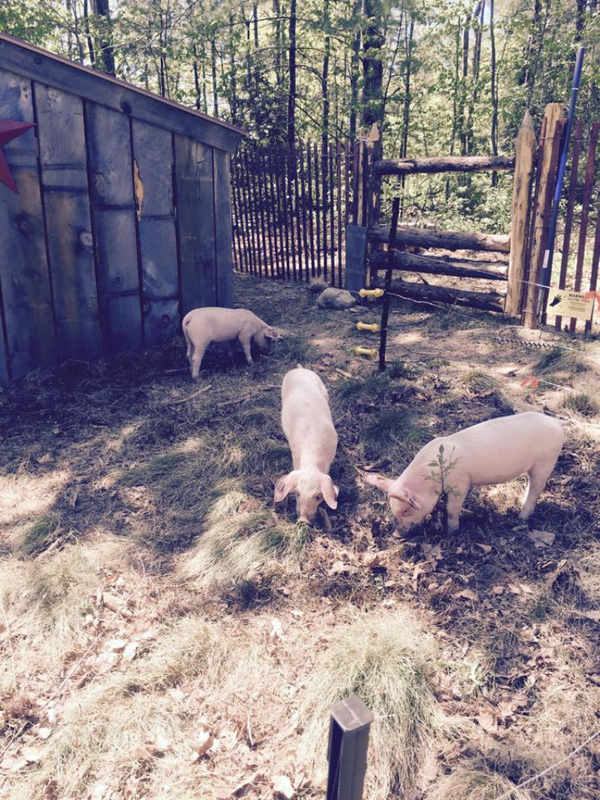 A: our entire homestead sits on just three acres and the pigs barely seemed to take up any room at all. Our pigs had a simple 8×4 shelter, equipped with hay for bedding to keep warm, and a 30×60 double fence. I call it a double fence because it really is. The inner fence being an electric fence that is solar powered. Pigs can be escape artists so it was important to us to run the electric fence first. Two feet around the perimeter of the electric fence, my husband and I built a wooden fence for extra stability and to keep our free range children, chickens and dogs from any shocking encounters. We only had four pigs this past year and this was more than enough room for them. They will dig up the earth and eat all of the grass and roots. Make sure they have a pasture like this to root up and keep busy. 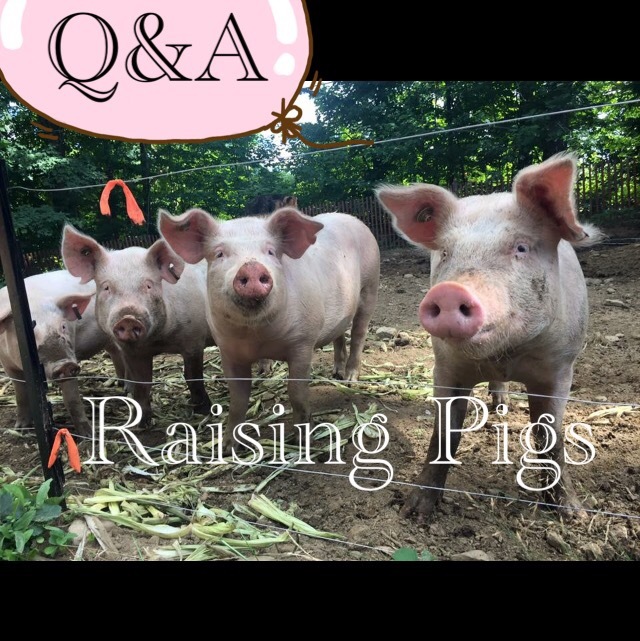 Q: can you only raise 1 or 2 pigs? A: two is better. There is a sense of safety in numbers plus having a cuddle buddy will help them to stay warm at night. They love to lay on one another and one little baby alone would be sad to say the least. Whether they are approaching slaughter weight or still young, they WILL fight over food a bit, however in my experience- if you give them plenty they learn to figure it out on their own. Q: what is the cost of a piglet? A: it will vary depending on your location but I would bet $100.00 to $150.00 for a wormed, 35lb piglet is pretty accurate. Q: how old will the pig be before it is fully grown and ready for slaughter? A: pigs are ready for slaughter once they reach the 250 lb to 275 lb mark. There are different measuring techniques out there for you to research but for us… Our 35 lb babies from April were fully grown and ready by October 25th-November 1st. Q: what vaccinations will they need? A: they should come to you wormed and at least have been given an iron shot. It’s important not to introduce too much into their system as it will change the quality of the meat. Pigs are not immune to infections such as pneumonia. If you notice your pig is not interested in their food or seems sleepy and withdrawn they may be sick. In most cases penicillin can be administered to help. 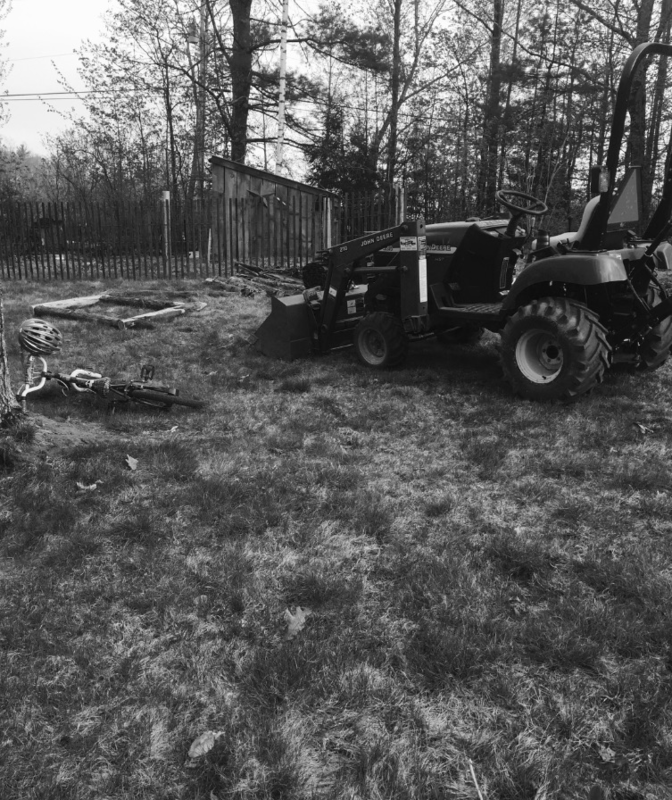 Call a veterinarian or a fellow homesteader at first suspicion of illness. Q: what should we feed our pigs and how much per day? A: pigs need a constant supply of water. Make sure you have a system in place that is easy to access so you aren’t hauling buckets of water to them all day, everyday. 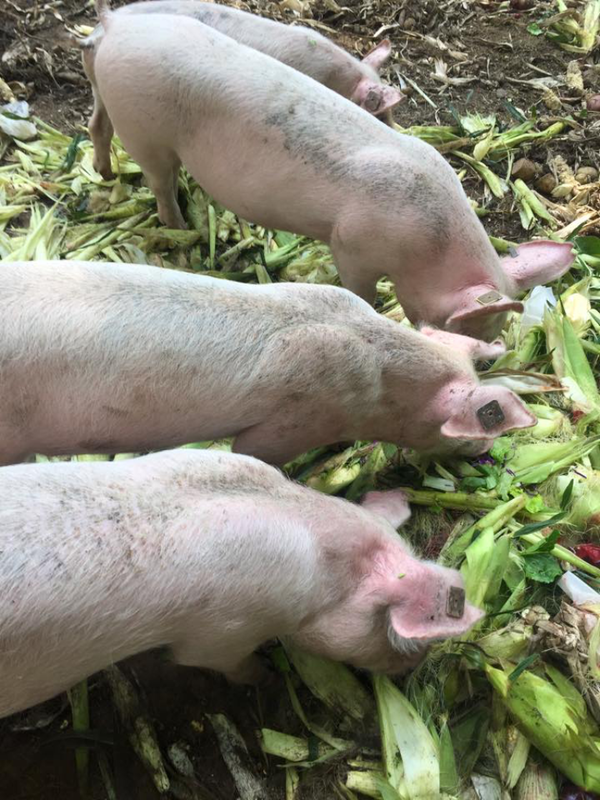 Pigs love to roll around in water and mud to keep cool and protect from bugs and pests, so havering a watering system is key!! We fed our pigs all natural pig and sow grain. This will range anywhere from $10.00-$15.00 per 50 lb bag. Go for the good stuff. You are what you eat as they say! 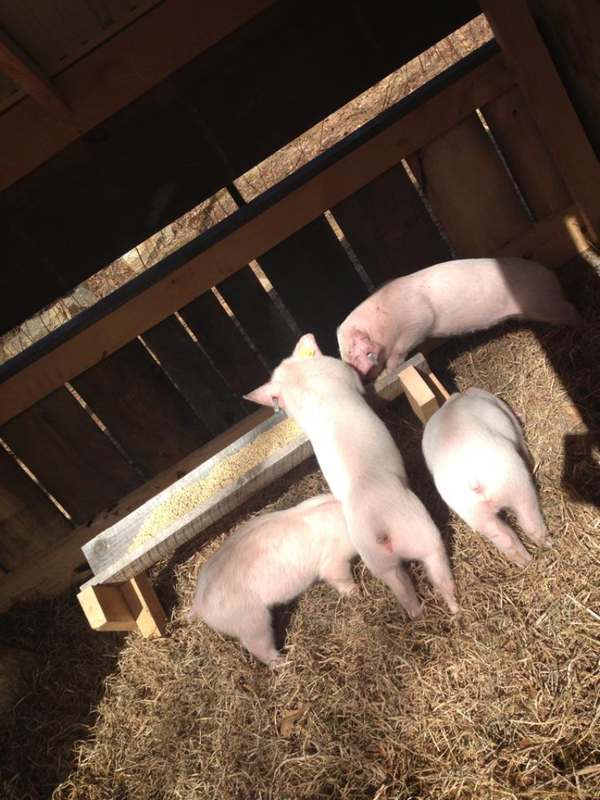 Pigs will eat around 6-8 lbs of grain per day. I got into the habit of splitting it up into two feelings per day. Morning and night. I was also fortunate enough to supplement with old fruit and vegetable scraps from my local grocer. I highly recommend researching your options for this as well. Your pigs will love you! 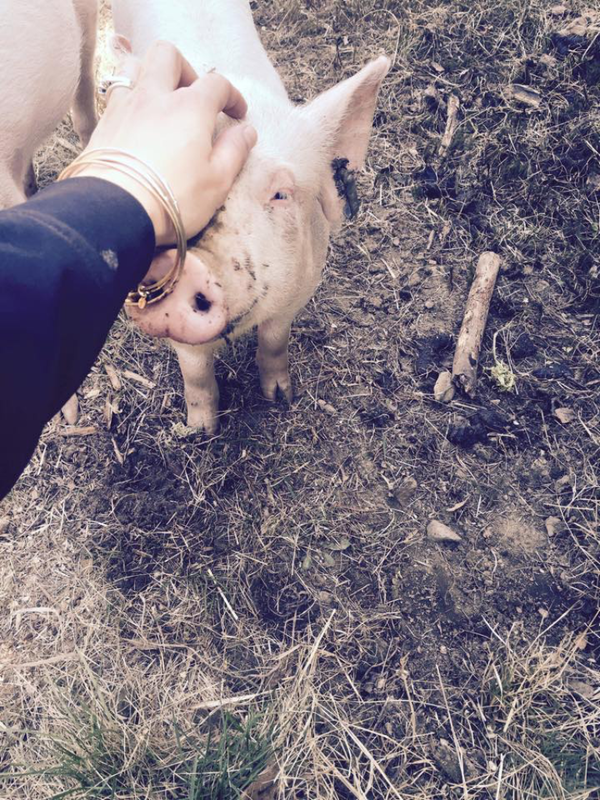 Q: how can I avoid becoming attached to my pigs? These guys and girls will steal your heart. Try not to name them, that’s my best advice. Give them a good life and take heart, not every pig is so lucky. All in all these animals are a delight to raise and they provide a surprising amount of meat. One 250 lb pig gave us 170 lbs of lovely organic pork for our family. It is well worth the effort…. And the feels. But yes, what a rewarding experience and I’m sure you’ll give them such a wonderful life that they may have never gotten had they gone home with different owners. Good luck!! Wishing you happy pig endeavors!